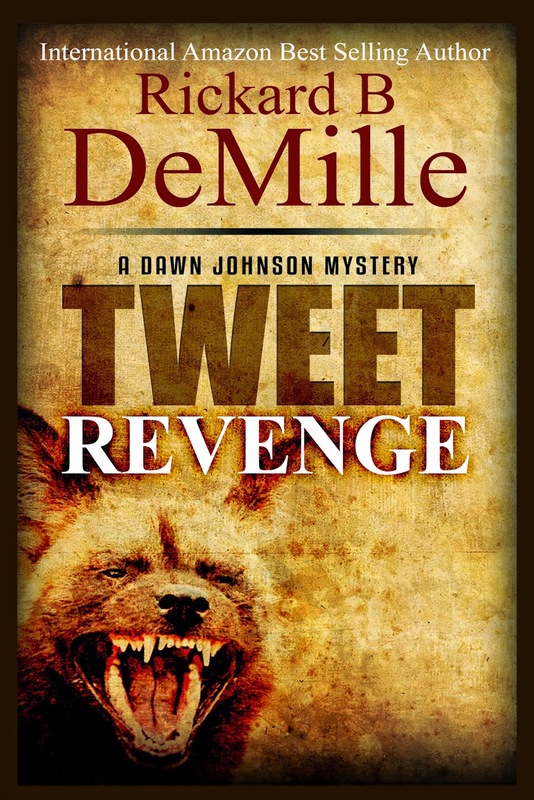 Rickard B DeMille is the author of the mystery novel Tweet Revenge - A Dawn Johnson Mystery. I grew up an avid reader. I Junior High I became addicted to SciFi, and read several books a week. I continued to read through college where I majored in Spanish, and took college courses in Spanish and New World Hispanic literature. My reading habits changed drastically during my time as an Officer in the Marine Corps. After the USMC, my reading returned to Mysteries, Thrillers, and SciFi. I read, and listen to a new audio book a week as I commute. I wrote my first novel, a thriller titled HELLFIRE, which was a Debut Dagger finalist and Amazon Best Seller for over six months. A serial killer is bringing justice to killers the criminal justice system failed to punish. To highlight the errors in the system, he tweets each step of his executions and dares the police to find him. Dawn Johnson (her FBI Agent father wanted a boy), a Rookie FBI Agent must survive the boss that wants her transferred and the bigoted Texas Sheriff in charge of the investigation to solve the murders. Anyone with discerning tastes. I think anyone that likes the Scarpetta or Women’s Murder Club stories will enjoy it. It also has a little JD Robb, without the romance. Tell a bit about the creative process for your stories, from the initial idea to the finished story being in the book. I actually wrote a screenplay about the main character, that finished second in an international competition. When I started novelizing it, I realized that my story was not the beginning, I had to write the back story in order to make the story I already had more complete. I had been wondering why I’d never seen a book that made social media an integral part of the story, and went for it. I’d written short stories, some of which were published. After I wrote a Masters’ Thesis, I got the urge to write longer stories. I have to resist the urge to slip back into Science Fiction, and stayed with Mystery/Thriller stories – until now. I would like to finish the Dawn Johnson, as well as the Travis Deacon Thrillers. My big project, however, is EXILES AND EMPIRES, set in the ancient Middle East. I usually don’t get writer’s block, I get researcher’s block. I love research, and can get really carried away in the detail of a topic. My next goal is pretty well set. I want to do for the Bible character Daniel, what my Great-great- really great – Uncle Cecil B DeMille did for Moses in the TEN COMMANDMENTS. I am writing a GAME OF THRONES type series based on the Babylonian and Egyptian Empires between around 600 BC. TWEET REVENGE hit the Amazon Best Seller list for its genre two weeks before its release, and stayed on it for almost a month after. It still hits the list briefly about once a week. The critical reviews have been outstanding.